raccoons imported from North America as "cute and cuddly" pets have grown into a nightmare for ecosystems and the agriculture industry of Japan. The animals, who either escaped or were abandoned by their owners, have been observed breeding in Hokkaido, Gifu, Kyoto and Nara regions of Japan. In Kanagawa province, the animals were discovered for the first time this spring. Six babies were found at three locations in Yokohama and Kamakura in April. A public wildlife shelter said it would keep the animals for two weeks. Yokohama Dog Rescue, a group that normally finds homes for stray dogs, offered a helping hand. Kiyoto Kitaura, a representative of the group, said he believes measures must be immediately established to prevent the racoon population from spiralling out of control. While taking care of the five surviving babies, Kitamura is now contacting wildlife experts and local government officials to start a study group on measures that need to be prepared before next spring, the next racoon breeding season of racoons. Racoons, particularly babies, are believed to have gained popularity in the late 1970s after a cartoon programme, Araiguma Rasukaru (Rascal the Racoon), was aired. However, many of the pets found their way into the wild after escaping or being discarded by the owners. More than 10 animals were first seen in the wild in the region of Eniwa, Hokkaido, in 1979. The racoons have inflicted considerable damage on the agriculture and fisheries industries in the northern island over the past few years. They have damaged corn crops and watermelon farms and rainbow trout hatcheries. The Hokkaido government estimated the damage at about over a million us dollars during the past three years. Farmers are granted permission to hunt the animals if local governments acknowledge they are a threat. At least 561 racoons were killed in 14 different municipalities in Hokkaido, the officials said. The city government of Eniwa decided to capture and kill the racoons to protect agricultural products. However, racoons in residential areas are captured and freed because they have done no harm. 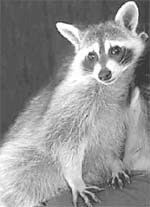 But animal researchers warn that racoons, who are not indigenous to Japan, pose a threat to domestic ecosystems. Studies show that foxes and grey herons were forced to relocate as racoons have invaded their territories.